Do you want to experience something different? 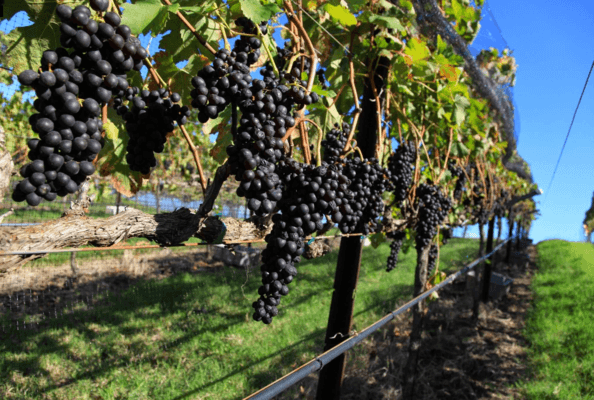 Love to try wines from the area when traveling? 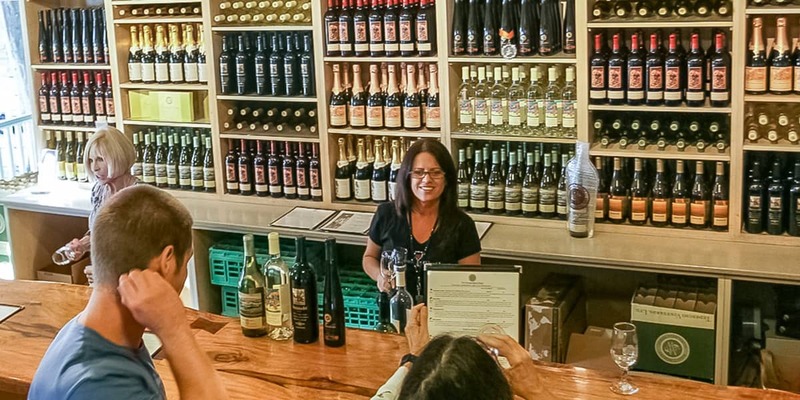 Maui Downhill is the only bicycle tour company that offers this particular tour which includes a wine tasting at Maui’s only wine vineyard, Maui Wine, Ltd. You will begin your tour as you ascend the slopes of Haleakala and head to the 6,500 ft. elevation mark, where your bicycle safari begins. You will gently descend the 21 switchbacks, where you will enjoy bi-coastal views of Maui’s central valley and the West Maui Mountains, all while taking in the beauty and fragrance of the flora surrounding you. Experience the wind in your face and the beauty Maui has to offer you. 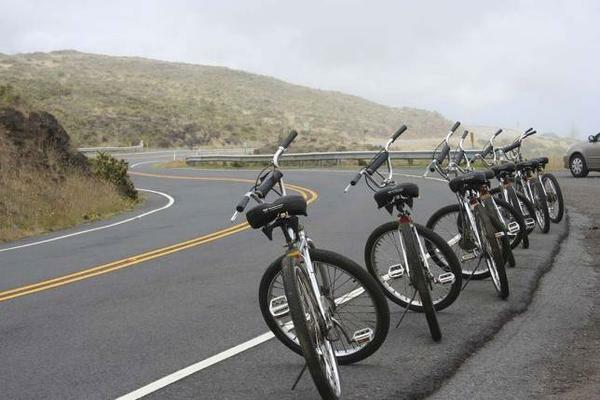 When your bicycle safari is done, your experienced tour guide will continue the tour as you are driven through the upcountry community of Kula to Ulupalakua Ranch, where you will be able to taste Maui! Minimum age 12 years old. Maximum weight of 250 lbs. Meet at our Kahului office located at 201 Dairy Road. Enjoy hot beverages and snacks. Helmets and rain gear (if needed) are fitted to each guest for their comfort. Bicycle tour begins at the 6500’ elevation mark outside of the national park. 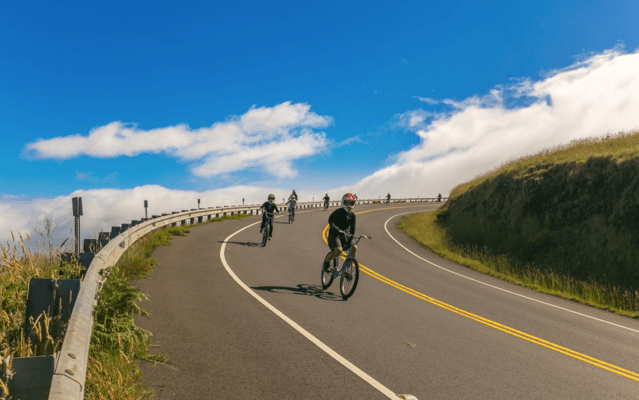 The tour will gently descend the 21 switchbacks on the western slopes of Haleakala (the world’s largest resting volcano). 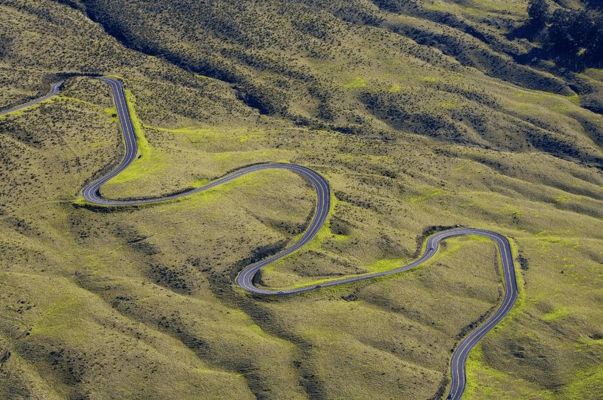 Riders will enjoy bi-coastal panoramas of Maui’s central valley and West Maui Mountains. Riders will enjoy the scent and sights of riding through pine and eucalyptus forests. There will be photo opportunities during the bike ride. Brief rest stop at the Maui Lavender Farm. Bicycle tour continues through beautiful Upcountry Maui. Van tour continues from Pukalani to Ulupalakua Ranch and Winery. No-host lunch at the Ulupalakua Ranch Grill, visit the King’s Cottage and the Museum History Room. Walk the winery’s beautiful gardens and enjoy free wine tasting. Van tour from Ulupalakua to Kahului with information and history of Maui’s plantation days. Tour duration approximately 6-7 hours. Competent riders – please, no beginners. 5 feet tall guideline height. Riders must sign acknowledgment of risk & safety form. You will begin your tour as you ascend the slopes of Haleakala and head to the 6,500 ft. elevation mark, where your bicycle safari begins. You will gently descend the 21 switchbacks, where you will enjoy bi-coastal views of Maui’s central valley and the West Maui Mountains, all while taking in the beauty and fragrance of the flora surrounding you.